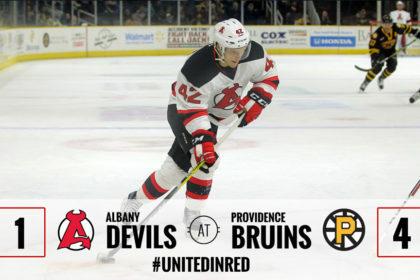 PROVIDENCE, RI – The Albany Devils fell to the Providence Bruins 4-1 at Dunkin’ Donuts Center Friday. The Devils record moves to 34-29-2-3. The Bruins improve their record to 40-19-5-4. Jordan Szwarz netted the Bruins first goal on a power play goal at 4:41 of the first period. Colton Hargrove and Danton Heinen were credited the assists on the play. Sean Kuraly furthered the Bruins lead on a penalty shot at 10:45. Jake DeBrusk netted Providence’s third goal at 6:21 of the second period. Austin Czarnik and Alex Grant picked up the assists on the play. The Bruins final goal was scored at 6:15 of the third period by Czarnik on a five-on-three powerplay. Matt Grzelcyk and Grant earned the assists. 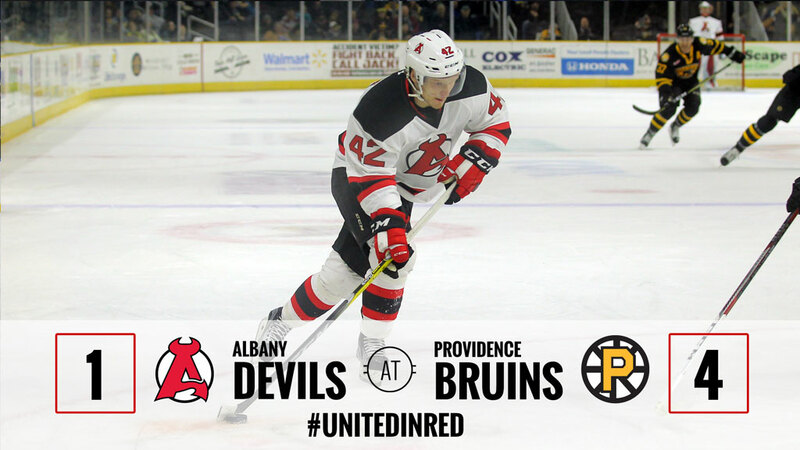 Yohann Auvitu got the Devils lone goal on a shorthanded play at 7:24 of the third period. 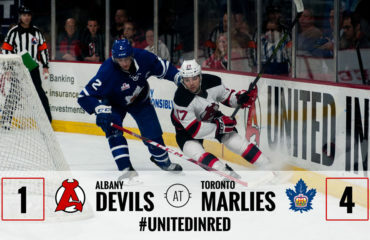 Shane Harper picked up the secondary assist which is his first point since signing with the Devils on March 1. The primary assist went to Austin Cangelosi which marks his first professional and American Hockey League point. Mackenzie Blackwood turned aside 31 of 35 shots and moves his record to 13-12-4. Zane McIntyre stopped 36 of 37 shots and improves his record to 19-4-1. 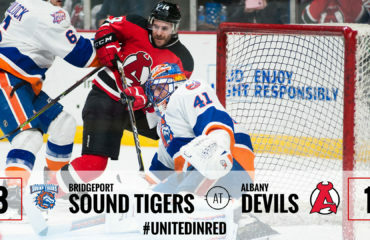 The Devils host the Hartford Wolf Pack Saturday at Times Union Center. 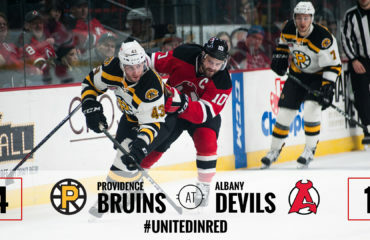 Face off is at 5 pm.